In his book, Stocks for the Long Run, Wharton Professor Jeremy Siegel proves that stocks have been the best performing investing for the past 200 years in the US. Equities outperformed other assets classes such as gold and fixed income. Typically, stock returns are derived from price appreciation and dividends. 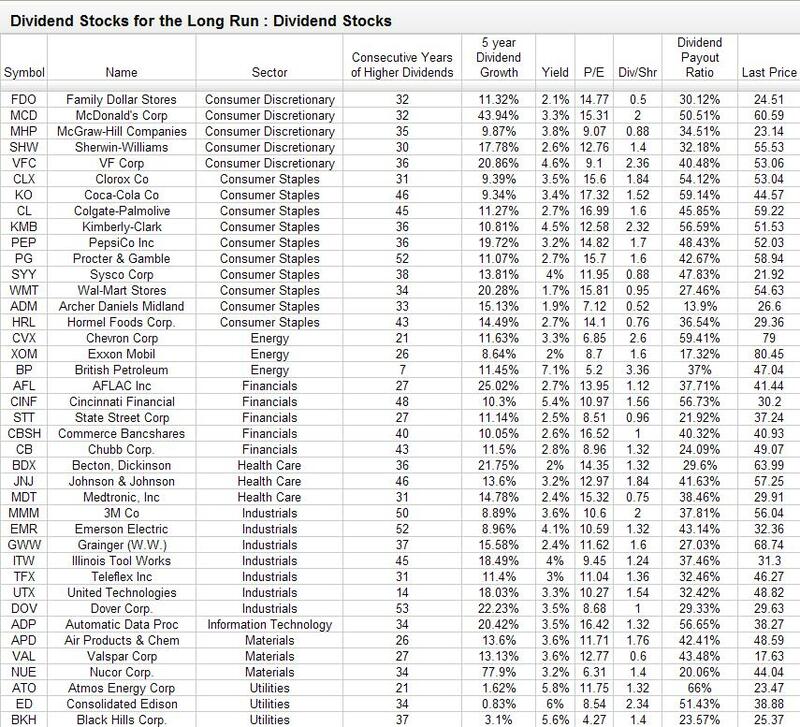 Dividend payments have historically accounted for 40% of the average annual stock market return. A lesser known fact is that reinvested dividends have provided for 97% of historical stock market returns. During tough market conditions such as the 2008 bear market, investors realize the positive of getting a return on your investment even if prices are collapsing across the board. Add in dividend increases, and several years down the road the income off the initial investment could be producing sizeable returns. Generalizations like this are usually ignored by investors however, as it doesn’t really provide a clear plan for action. In order to respond to this I have included the best dividend stock for the long run. They come from many sectors and industries, and represent growing as well as maturing industries. The portfolio is not a recommendation to buy or sell any stocks, as it reflects my specific financial risk tolerance. Always do your own research before initiating a position in any financial instrument. Typically dividend investors are being told to hold stocks in certain sectors such as energy trusts, utilities and financials. I do believe however that concentrating ones portfolio only on certain sectors does increase your risk. Chasing current dividends yields is seldom the best plan for action. Overweighting certain sectors might also be a recipe for a financial disaster. Maintaining a balanced approach that focuses on dividend growth and yield, as well as the traditional tools like diversification and dollar cost averaging, could be the best strategy for the long run. Furthermore being flexible could also aid to your portfolio. Chances are that new sectors of the economy will emerge over the next few decades. 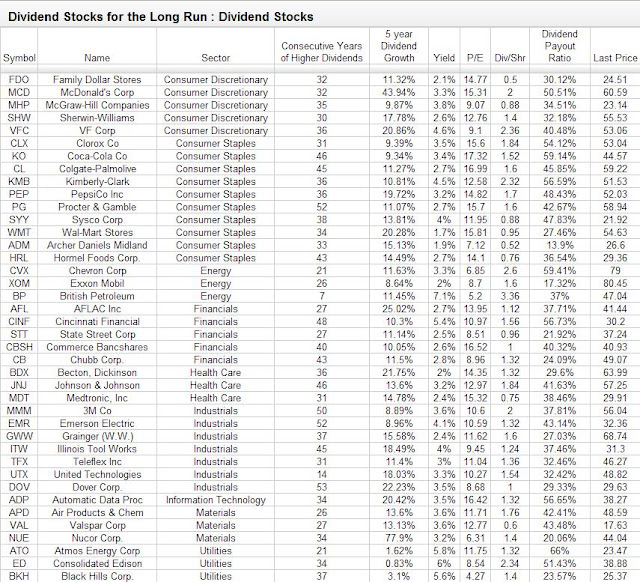 Adding reasonably priced dividend achievers is one way to be involved in those stocks. The dividend stocks for the long run portfolio is underweight in technology and telecommunications services, and overweight the Consumer Staples and Consumer discretionary sectors. It only contains one foreign based stock, BP. The average yield is 3.45%, whle the average five year dividend growth rate is 15.90%. If the long term dividend growth rate stays at 6% on average for the whole portfolio, the expected yield on cost will be around 7% in 12 years and 14% in a little over 2 decades. You could also check it from this link. I will be tracking the following portfolio versus the market using marketocracy virtual mutual funds.